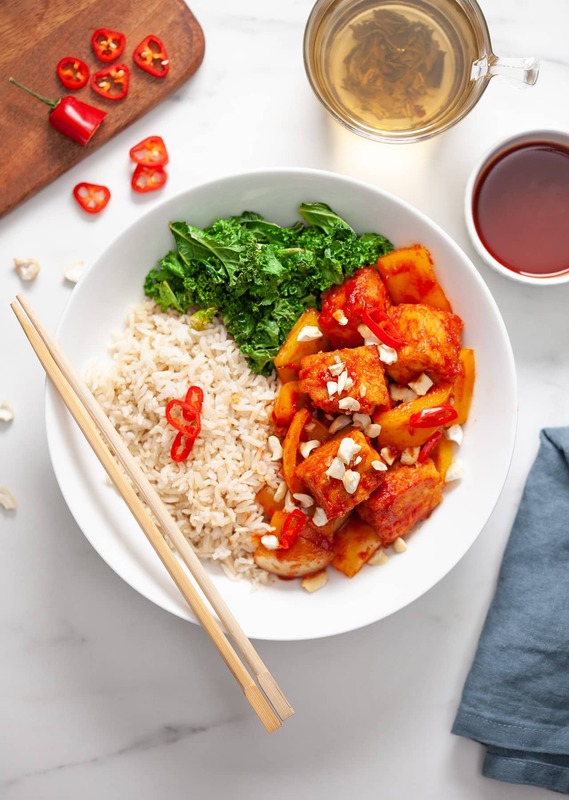 We love recreating our favourite dishes from around the world, and it doesn’t get much better than the classic Chinese sweet and sour. 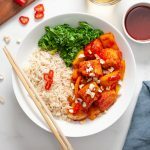 So when our friends at Mindful Chef asked if we wanted to try their sweet and sour sticky tofu from their new range of vegan recipe boxes, we jumped at the chance! 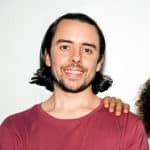 For those who don’t know, the guys over at Mindful Chef deliver awesome recipe boxes with all the quality pre-portioned ingredients and recipe cards you’ll need to make their recipes in under 30 minutes. This outrageously delicious recipe has everything you want from a classic sweet and sour dish. The tofu is sticky, the sauce is tantalisingly tangy and you’ll have it ready quicker than it’ll take you to order then wait for a take-away. Served alongside deliciously crispy kale and brown rice, this ticks all the boxes for a nutritious and satisfying midweek meal. 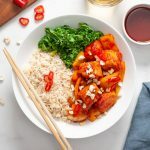 If you’re looking for simple, delicious and nutritious meals to cook at home, make sure you check out Mindful Chef’s super tasty range of new vegan recipe boxes. You can pick from 6 vegan recipes each week. And don’t forget to use the discount code SOVEGAN10 at checkout to claim £10 off your first 2 boxes! Alongside this sweet and sour sticky tofu, you’ll also find their fajita bowl with spicy quinoa, Mediterranean artichoke with citrus lentils and vegan jackfruit ‘crabcakes’. The recipe boxes come with all the pre-measured ingredients you’ll need, minus the obvious essentials like salt, pepper and oil, so it’s a great way to eliminate food waste! Preheat the oven to 180°C / 350°F and boil water in a kettle. Rinse the brown rice and place into a saucepan with 400ml (13.5 fl.oz) boiling water and a pinch of salt. Simmer for 20-25 minutes until cooked, then drain. Cut the yellow pepper and onion into bite-sized pieces. Roughly chop the kale. Finely chop the chilli (remove the seeds for less heat). Drain and rinse the tofu, pat dry with paper towel. Cut the tofu into 2cm cubes. To make the sweet and sour sauce; in a small bowl mix together the tamari, tomato puree maple syrup, apple cider vinegar and half of the chilli with 2 tbsp of cold water. Place the cornflour into a bowl with a pinch of salt. Place the tofu cubes into the bowl and coat evenly. Place the kale on a baking tray with a pinch of salt and combine with 1 tsp oil, spread out into an even layer. Place in the oven for 5-10 minutes or until turning crispy. Heat a large wok or frying pan with 2 tsp oil on a medium-high heat and cook the tofu for 10 minutes turning occasionally until turning golden. Then add the onion and pepper and cook for 5 minutes until softening. Add in the sweet and sour sauce and turn down the heat. Cook for 1-2 minutes until the sauce has thickened. 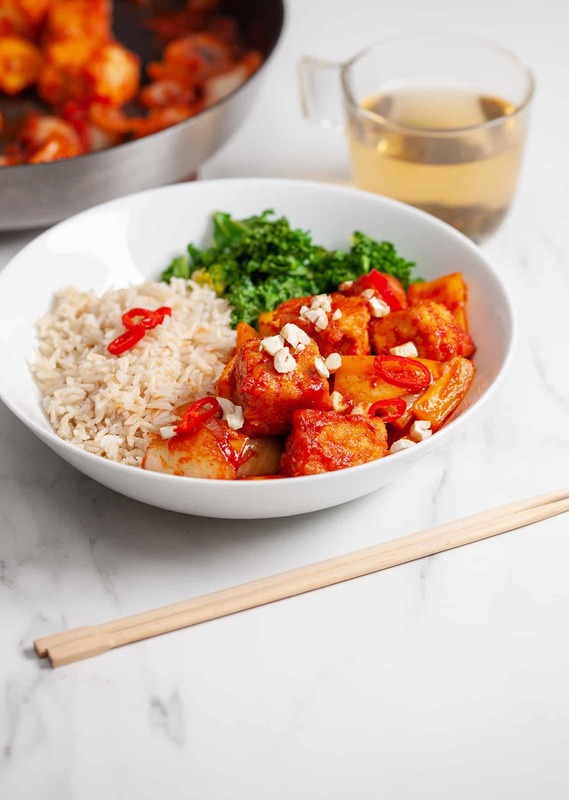 Spoon the brown rice into 2 warm bowls alongside the sweet and sour tofu and kale. Sprinkle with some crushed cashews and the remaining chilli. There’s a step missing, I think. When do you coat the tofu cubes with the sweet and sour sauce? After the cornflower step? Hey Sandra! It’s in step 6. We add the sauce to the tofu, onion and pepper when it’s frying in the pan. Thanks!